Another Kenworth W900, a good basis for customizing, according to many, whether as a semi to operate, as a show piece, or to use to add an luxury motorcoach unit onto it. Lots of light on this one, chrome, beautiful painting. Tire sizes went from 24.5 to 22.5. This Kenworth has a sleeper studio 86. Big “bumper” cover changed with new headlights. 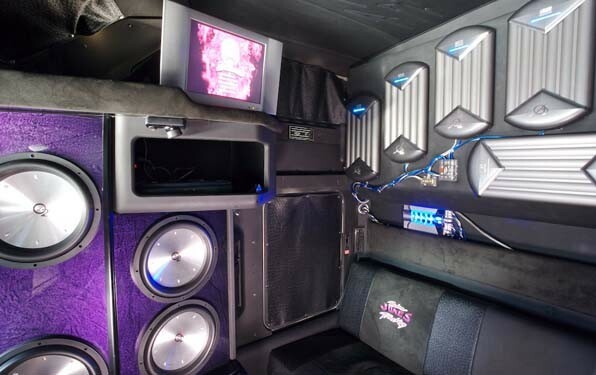 It has an upscale interior with Hi-Fi, LCD TV and many watt sound system. A big spoiler overlooks the cabin. Many fans buy trucks like this one for less than $20,000 and use them to customize for truck shows. The price of the preparation often exceeds that of the truck. The 1999 Kenworth has a Caterpillar engine. 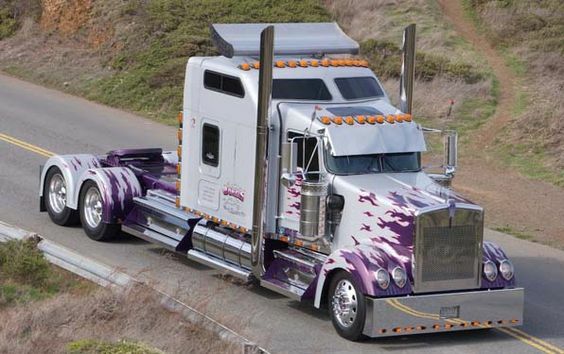 The first version of this custom semi was finished in 1997 with a very short cab. In 2000 the owner decided to extend the cabin 12 feet, not a big visual difference, but a lot of work. Then a completely new paint job was done on the rig. This Kenny has been associated with Bruce Springsteen’s “Magic” North American Tour in 2007, but I’m not sure exactly what the association is. Was this truck used to tow the musician’s trailer? If anyone knows, let us know. The W900 is still made by Kenworth, and is advertised as a comfortable, stylish ride. Its a class 8 truck model, known for its long-nose style. Over time, the K900 saw other models, such as the T600, come into use — more aerodynamic — but the W900 has remained a production model, which is partly due to its plain popularity with trucking owner-operators.